Homer Lea’s career was stranger than many found in romantic fiction. Lea (1876-1912), a five-foot hunchback who suffered from debilitating health, overcame his afflictions in pursuing dreams and ambitions that few men ever achieve. He is best remembered as a somewhat mysterious adventurer, author, and geopolitical strategist who challenged conventional wisdom and went against significant odds in forging himself a role on the world scene. His youthful desires for adventure, including the pursuit of a military career, were fulfilled when he found opportunities for advancement through the Chinese reform and revolutionary movements. He began his adventures in 1900, after dropping out of Stanford University and going to China during the Boxer Rebellion, and ultimately became the trusted personal military advisor to Chinese revolutionary leader Dr. Sun Yat-sen during the 1911 Chinese Republican Revolution. In the interim he became a celebrated author and internationally recognized geopolitical strategist. In 1912, he was poised on the brink of fulfilling a Napoleonic destiny in China when his health gave out. He died later that year, shortly before his 36th birthday, leaving an indelible mark on the history of his times. Lea became involved in Chinese affairs while attending Stanford University (1897-1899). In San Francisco, he joined a secret Chinese movement, the Pao Huang Hui (Protect the Emperor Society), which had been organized by K’ang Yu-wei, formerly a close adviser to the Emperor Kwang-hsu. K’ang Yu-wei was behind the Emperor initiating a series of liberal reforms in the late 1890s that led to a palace coup d’état by the conservative Regent, Empress Dowager Tzu Hsi. She imprisoned the Emperor and put a price on K’ang Yu-wei’s head. K’ang Yu-wei then established the Pao Huang Hui to restore the Emperor to power. Lea recognized a great opportunity for adventure with the Chinese and promoted himself among the Reformers as a military expert, claiming to be a relative, which he was not, of the famous Confederate General Robert E. Lee. He dropped out of Stanford and eventually went to China in the summer of 1900 where he received a lieutenant general’s commission in the would-be Pao Huang Hui army. His role entailed training Pao Huang Hui soldiers in Shensi Province just as China became embroiled in the Boxer Rebellion. Lea took no part in any fighting. Ultimately the Pao Huang Hui’s military plans to restore the Emperor to power failed and he returned to the United States (U.S.) as a valued member of the movement to continue his work. Back in the U.S., Lea figured prominently in furthering Pao Huang Hui goals. In 1904 he masterminded a plan to covertly train a cadre of Chinese soldiers in America. Under his guidance the Pao Huang Hui established a network of military schools, as a cover, in more than twenty cities nationwide. The intent was to have these soldiers return to China, infiltrate the imperial Chinese army where they would be in a position to help restore Emperor Kwang-hsu to his throne by force. Lea hired former U.S. Army soldiers for instructors and commissioned them in the Pao Huang Hui’s army. He outfitted his soldiers with altered U.S. Army uniforms, simply replacing the national eagle on the buttons and cap with the imperial Chinese dragon. For himself, he wore an American lieutenant general’s uniform, with the altered insignia, along with a modified U.S. Army officer’s sword with a dragon handle. His covert training operation nearly collapsed in 1905 when the U.S. Secret Service and several states investigated it for possible violations of neutrality laws. He also fended off the efforts of another American with ties to the Pao Huang Hui, an opportunist named Richard A. Falkenberg, who sought to install himself at the head of the Chinese cadets. Lea’s affiliation with the Pao Huang Hui ended by 1908, the year Emperor Kwang-hsu and the Dowager Empress died (within two days of each other); so did his commitment to bolstering up the Manchu dynasty. Lea’s next opportunity in Chinese affairs brought him into contact with Dr. Sun Yat-sen, whose revolutionary movement was dedicated to the overthrow of the Manchu dynasty. In 1910, Dr. Yung Wing, an eminent Chinese scholar and friend of Lea’s, arranged for Lea to join forces with Sun Yat-sen, who was in the U.S. on a fund raising trip. Sun Yat-sen made Lea his military advisor and promised him an important military position in the Chinese Army if his revolutionary movement succeeded. In addition to offering Sun Yat-sen military advice, Lea offered to contact some influential businessmen who might be induced to help deliver needed financial backing to the revolutionary cause. Lea then helped organize a small covert group of Americans and Chinese, known as the “Red Dragon” conspiracy for this purpose. The incentive for the businessmen was great. Sun Yat-sen promised them virtual carte-blanche in China’s financial affairs if his revolution succeeded in toppling the Manchus. The Red Dragon conspirators believed they could raise enough money for the revolutionary movement if it did not act hastily and lead to failure, particularly since Sun Yat-sen had a succession of failed revolutionary uprisings behind him. As the events unfolded, however, Sun Yat-sen’s followers did act hastily. The Red Dragon conspirators dropped out of Sun Yat-sen’s plans after an attempted revolutionary uprising, launched by Sun Yat-sen’s followers failed in March 1911. Despite the financial setback, Lea remained a loyal and valued advisor to Sun Yat-sen. He became instrumental to Sun Yat-sen’s success in October 1911. At that time Lea was in Germany on an extended honeymoon with his new wife, his former secretary Ethel Powers, being treated for his failing health. He received word from Sun Yat-sen, who was on a fund raising trip in Colorado, that a new revolutionary attempt had finally succeeded. The days of the Manchu dynasty were numbered. Sun Yat-sen, however, did not travel immediately to China. Instead, he cabled Lea for help. He hoped Lea could use his important contacts in Washington and London to try and arrange Western financial backing for a new Chinese republican government. He then met Lea in London where they both tried to obtain British financial backing. When their efforts to secure financial backing failed in Washington, London, and finally Paris, Sun Yat-sen and the Leas sailed to China. The Western powers believed that General Yuan Shi Kai, the leader of imperial forces, would ultimately resolve China’s problems. The powers had no faith in Sun Yat-sen.
Lea’s prospects for playing a key role in Chinese affairs appeared to rise as he sailed to China. Sun Yat-sen planned to make Lea the Chief of Staff of the new Chinese Republican army. Lea had already purchased several custom-made military uniforms in London. Furthermore, U.S. State Department representatives covering the progress of the trip reported that Sun Yat-sen, who was slated to become the first president of the new Chinese Republic, did not make a move without first consulting Lea. After arriving in China in December 1911, Lea’s immediate expectations began to wane. Sun Yat-sen was elected president but resigned in favor of Yuan Shi Kai, in the hopes of unifying the new republic and avoiding a bloody civil war. Although Lea remained a close advisor to Sun Yat-sen, he was seen as an unwelcome outsider in the eyes of other Republican revolutionary leaders. They knew very little about him and had no place for him in their plans. Lea’s failing health then brought an abrupt end to his involvement in Chinese affairs. In February 1912 he contracted influenza and complications resulted. He went into a week-long coma and awoke blind and partially paralyzed. His doctors advised prolonged rest if he were to recover. He returned to California in his wife’s care with hopes of someday rejoining Sun Yat-sen, however, he never recovered. He died in November 1912, several weeks before his 36th birthday. He had a private funeral and his remains were cremated. Although Lea’s will stipulated he be buried in China, Ethel Lea felt she could not afford the trip and kept his ashes until her death in 1934, after which she also was cremated. Her son, Joshua B. Powers, finally fulfilled Lea’s last wishes in 1969, when the Leas’ ashes were received by President Chiang Kai-shek (Sun Yat-sen’s brother-in-law) of the Republic of China and temporarily interred at a cemetery near Taipei. The interment was marked by a large and formal ceremony to honor “General Homer Lea, American military advisor to Dr. Sun Yat-sen.” Chiang Kai-shek envisioned that when the two Chinas were reunited, the Leas’ ashes would be transferred to Nanking and interred next to Dr. Sun Yat-sen’s mausoleum. On his rise to prominence, Lea became an internationally known author and authority on military strategy. He first tried his hand as a novelist with The Vermillion Pencil: A Romance of China (1908), which received mixed reviews and has largely been forgotten. He then turned his talents to non-fiction. His second book, The Valor of Ignorance (1909), examined American defense and in part prophesied a war between America and Japan. It created a minor sensation at home and abroad and instantly elevated his reputation as a credible spokesman on defense issues and military strategy. Two retired U.S. Army generals, former Army Chief of Staff Adna R. Chaffee and former Chief of Artillery Joseph P. Story, wrote glowing introductions to the book, which also contained a striking front-piece photograph of Lea in his lieutenant general’s uniform. The unsuspecting reader could easily have assumed Lea was a respected military officer. The book contained maps of a hypothetical Japanese invasion of the Philippines and was recommended reading for many American military officers, particularly among officers who served in the Philippines over the next generation. His final book, The Day of the Saxon (1912), written at the urging of Field Marshal Lord Frederick Sleigh Roberts, former commander-in-chief of the British Army, examined British imperial defense and predicted the break-up of the British Empire. It too was controversial and received most of its critical attention in Europe. In The Valor of Ignorance and The Day of the Saxon, Lea viewed American and British struggles for global competition and survival as part of a larger Anglo-Saxon Social Darwinian contest between the “survival of the fittest” races. In an impending clash of races he believed was inevitable, his goal was to promote Anglo-Saxon interests. His affiliation with China figured prominently in his world-view. He ultimately sought to forge an alliance between the Anglo-Saxons and Chinese in an effort to counterbalance other regional and global competitors. Lea’s writings on geopolitics and military strategy represented his most enduring legacy. Following his death, his writings on the threat of Japanese imperialism and expansionism in Asia and the Pacific Ocean helped shape perceptions for the next generation of American civilian and military leaders concerned with Far Eastern national security challenges. For example, Japan’s aggressive policies that led to the establishment of the puppet state of Manchukuo in the 1930s occurred along the lines he predicted. Furthermore, his predictions of an inevitable clash between Japan and the United States appeared vindicated by Japan’s surprise attack on Pearl Harbor that led America into World War II. There then followed a starling similarity between his hypothetical plans for a Japanese invasion of the Philippines and the actual events. Although Lea had not been the only writer to warn of a war between Japan and the United States, his predications came closer to actual events than any of the others and soon established his reputation as an overlooked military genius and prophet for which he is best remembered. To date, much of what has been known about Lea has been a healthy mix of fact and fiction. For example, journalist Clare Boothe’s lengthy introduction to the 1942 edition of The Valor of Ignorance highlighted the book’s influence on General Douglas MacArthur, the U.S. military commander in the Philippines, and his staff, and helped elevate Lea to the status of forgotten military genius and prophet. Boothe’s introduction, however, also unwittingly helped foster and perpetuate the aura of mystery and myth that continued surrounding Lea. Not unlike medieval monks who copied books by hand, including their mistakes, Boothe drew on numerous accounts, some accurate and many not, from writers and former Lea acquaintances without discriminating between myth and reality. Boothe made the same mistake as many before her and many after her. The problem began during Lea’s lifetime when he was widely known as an international “man of mystery” in part due to many exaggerated published accounts, rumors, and speculations about his exploits. He did little to set the record straight because the accounts helped advance his career without drawing undue attention to his illegal and covert activities. Furthermore, his papers were intentionally destroyed after his death to protect his former associates from possible legal prosecution. Separating the fact from the fiction of Lea’s life became possible in the late 1960’s, after the personal papers of former Lea associates surfaced and were made available to researchers. There have only been two well-documented published Lea biographies. Eugene Anschel’s Homer Lea, Sun Yat-Sen and the Chinese Revolution (Praeger, l984) marked the first major account of Lea’s exploits. Anschel, a lawyer by training, made no claim to writing a definitive Lea biography, and noted in his prologue: “There remain, however, many gaps in the story that cannot be filled and many uncertainties that cannot be dispelled.” Anschel’s assessment of Lea, while significant, also fell victim to the perennial problem of separating fact from fiction. His biographical account contained numerous historical errors and continued to perpetuate several Lea myths. 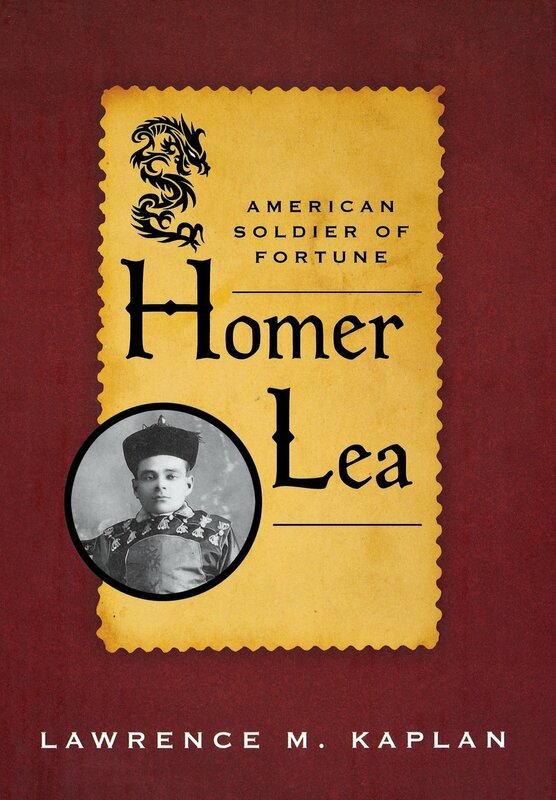 Lawrence M. Kaplan’s Homer Lea: American Soldier of Fortune (University Press of Kentucky, 2010) benefited from additional sources in providing a more complete and accurate version of Lea’s career. The evolution of the internet provided Kaplan, a professional historian, access to research materials that were previously unavailable through conventional research and his research also included materials from private Lea family papers that have contributed to making Homer Lea: American Soldier of Fortune the most accurate, well-documented account of Lea’s life to date.